The Blueberry Wine Sunrise is a perfect drink to serve with brunch, or at anytime. Premium Orange Juice, in equal quantities. more distinct, then serve and enjoy. 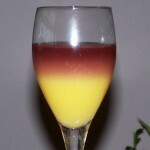 Using a 4 to 6 ounce wine glass of your choice, First pour the desired amount of orange juice into the wine glass, Then, gently pour an equal amount of Cherry Knoll Sweet Blueberry wine down the side of the glass (very gently down the side so it does not mix into the orange juice – the wine will stay on top), Allow the Blueberry Wine Sunrise to stand for 2 or 3 minutes to allow the layers to become more distinct, then serve and enjoy.